Abuja, Nigeria. October 04, 2012 – The results of a recently released snap poll conducted by NOI Polls have revealed that since the removal of fuel subsidy in January 2012, Nigerians have witnessed increases in mainly cost of transportation and food prices. It will be recalled that NOI Polls had earlier conducted a pre-subsidy-removal poll in October 2011 to establish whether or not Nigerians supported the planned fuel subsidy removal at the time. Following from the official removal of fuel subsidy on 1st January 2012, this follow-up poll conducted in May 2012 represents a post-subsidy-removal poll that sought to gauge the perception and experiences of Nigerians since after the fuel subsidy removal in January. The recent poll was conducted from 23rd – 25th May, 2012. It involved telephone interviews of a random nationwide sample. 1,034 randomly selected phone-owning Nigerians aged 18 years and above, representing the six geopolitical zones in the country, were interviewed. With a sample of this size, we can say with 95% confidence that the results obtained are statistically precise - within a range of plus or minus 3% of what they would have been if the entire population had been surveyed. The questionnaire was designed in English and the survey was conducted in English, Hausa, Yoruba, Ibo, and Pidgin, to ensure coverage of relevant geographical and demographic groups. A high proportion of both male and female respondents were sampled. However, only 36% of females completed the survey compared with 64% of males who did. Also, Majority of respondents were aged 30-45 (48%) and 22- 29 (38%). 5% of the respondents were aged 46-60, while 7% were aged 18-21. The age category with the lowest frequency of respondents was 60 and above (1%). In addition, majority of the respondents (19%) of respondents classified themselves as professional workers, closely followed by civil servants (18%) and traders (17%). Artisans and students represented 15% and 13% of the respondents respectively while 8% said they were unemployed. When asked if they are in support of the removal of fuel subsidy, less than half of the respondents (48%) answered in the affirmative, while majority (49%) answered in the negative. In addition, when compared to the result obtained six months ago, the current result reveals a marked difference in the responses obtained from respondents. 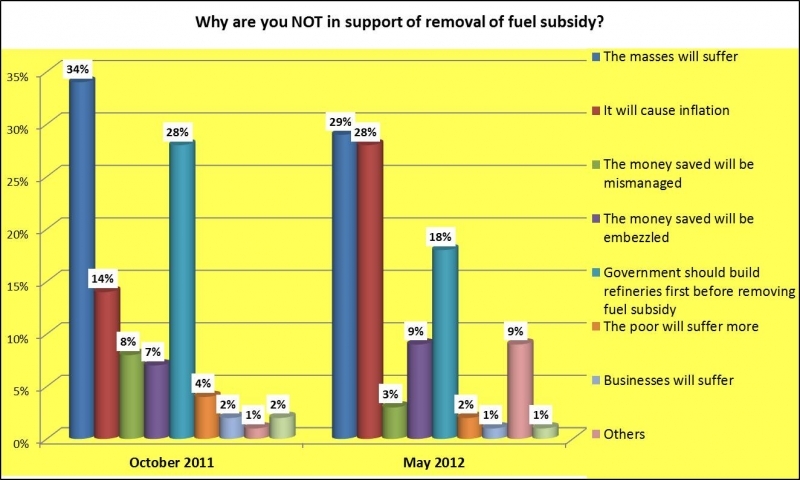 In the first wave, almost 9 in 10 respondents (88%) were against the removal of fuel subsidy. This increase in support could be attributed to the accusations of corruption in the sector and gross mismanagement revealed by fuel subsidy probe. Of the 48% of respondents in support of the government’s decision to remove fuel subsidy, 56% of respondents stated that the removal of subsidy would help boost the economy, hence the reason why they are in support of its removal; while 24% believed the money could be used to build refineries; and 19% support the subsidy removal because the money saved could be invested in other sectors of the economy. The results vary significantly when the 1st and 2nd waves are compared. In the second wave the majority (56%) stated that the removal of fuel subsidy will boost the economy but only 8% had that opinion previously. In the first wave, 45% supported the removal because the money saved can be invested in other sectors but in the current wave, only 19% said that. This change might be because Nigerians gained a better understanding of the fuel subsidy regime and its impact on the economy following insight given by the government. Reasons for NOT supporting the removal of fuel subsidy? Of the 49% of respondents that are not in support of the fuel subsidy removal, 34% of respondents believed the masses will suffer the most; while 28% said it will affect the poor the most; and 14% said it will cause inflation. In addition, 8% of respondent said they are not in support of the removal because the money saved will be mismanaged, and 7% said the money saved will be embezzled. In the second wave of the survey, a slight majority (29%) still did not support the removal because they thought the masses would suffer; this is down from 34% in the first. However, the proportion of respondents that did not support the removal of subsidies because of inflation had doubled (from 14% to 28%). Also, the number of respondents who believed the poor would suffer more has reduced from 28% in the first wave to 18% in the second. The present experience of food prices going up slightly following the reduction of fuel subsidies is considered to be a factor responsible for more respondents not supporting because of inflation. Respondents were asked if the removal of fuel subsidy has had any impact on household spending, 77% of respondents stated that their spending has increased since the fuel subsidy removal while 9% said their spending has reduced. However, 11% of respondents said their spending has remained the same. Majority of respondents (64%) who said their spending has increased since the removal of fuel subsidy said they spend more on transportation while 26% said they spend more on food items. Also, 2% of respondents said they spend more on school fees and running the generator respectively. When asked about their reaction if the government decides to further remove subsidy on fuel, 38% said they will be in support of such a decision, while 19% said they are indifferent. 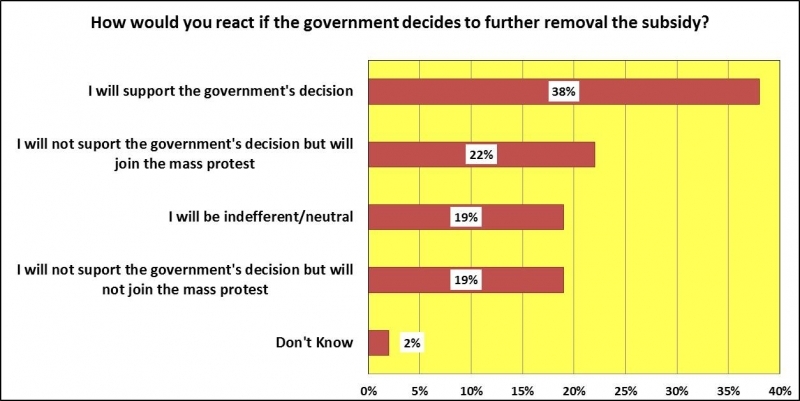 However, 22% said they will not support the removal and will join mass protest; whereas 19% said that though they will not support the decision but they will not join mass protests. The result from the recent snap poll shows that there has been change in support for the removal as almost 5 in 10 Nigerians (48%) now support the policy of fuel subsidy removal. On one hand, this may be attributed to the awareness that was created by the government on the necessity of the subsidy removal; while on the other hand, it may also be linked to the accusations of corruption that have trailed the sector and gross mismanagement revealed by fuel subsidy probe. Although the proportion of respondents not in support of the removal of fuel subsidy has reduced (from 88% in 2011 to 49% in 2012); nonetheless, majority of such respondents believe that the masses will suffer the effects of the removal (29%), while 18% of respondents feel the money saved will be embezzled by the government. In addition, 77% of Nigerians have experienced increased in household spending, bulk of the money spent goes on transportation (64%) and food (26%). In conclusion, for the policy of subsidy removal to be sustained and supported, the Nigerian government will require a transparent monitoring and evaluation mechanism with clear indicators to track the allocation of the fuel subsidy reinvestment funds, under the SURE-P scheme. This will enable Nigerians assess the efficiency of the reinvestment scheme in terms of the provision of projects stated in the SURE-P document and to ascertain value for the funds expended. The government will also need to regularly communicate its plans and actions with regards to further planned removal of fuel subsidy in a transparent manner.